Tony Bramwell, Beatles’ longtime friend and personal assistant. American Songwriter Magazine, June, 2012. “This documentary keeps you on the edge of the chair with wonderful insights into the doings of our Fab 4 during the sixties. Amazing”. 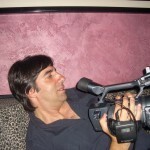 Director/Producer Seth Swirsky is an accomplished singer-songwriter and author of three bestselling books. Seth was born in New Haven, Connecticut and grew up in Great Neck, New York. During his academic studies at Dartmouth College, Seth used to drive down to New York City where he wrote jingles like the Thomas’s English Muffins and the score to an off-Broadway show Oh Baby! Later, Seth became a staff songwriter with Chappell Music (now, Warner-Chappell). The first group to record one of his songs was Air Supply (After All). Seth’s most well-known songs are probably the Grammy-nominated, Tell It To My Heart and Prove Your Love sung by Taylor Dayne, Love is a Beautiful Thing sung by Al Green, Instant Pleasure sung by Rufus Wainwright and Did You Give Enough Love sung by Celine Dion. In 1996, the first of his three books, Baseball Letters, came out. The book consisted of handwritten letters Swirsky received from, mostly, retired major league baseball players in response to his questions about their careers and lives. In 1999, his second book of letters came out, this one with letters from baseball pitchers. It was called Every Pitcher Tells A Story (Times Books) and was an L.A. Times bestseller. The third book in the trilogy, Something to Write Home About (Random House), had letters in it from not only players but, fans of the game, like Tim Russert, President George W. Bush, Sir Paul McCartney and many others. It was during the making of these books that Seth got into collecting historic baseball memorabilia. Much of the collection was featured in exhibitions at The Queens Museum and Bronx Museum in 2005. Some of the highlights are the baseball that went through Bill Buckner’s legs during the 1986 World Series and Reggie Jackson’s 3rd home run from Game 6 of the 1977 World Series. In 2004, Seth put out his first Solo CD Instant Pleasure, which won the L.A. Music Award for Best Pop Album of the year. In 2007, Seth released a second album in collaboration with singer-songwriter Mike Ruekberg under the name The Red Button. The album, She’s About To Cross My Mind proved very popular, winning many year-end Readers Polls for Best Album of the Year.The single from the record, Cruel Girl, was #1 on Billboard Magazine’s “Coolest Song of the Week” chart, in July, 2007. In 2010, Seth released his highly acclaimed second solo album. Watercolor Day. The title track to the album won Best Pop Song at the Hollywood Music in media Awards in November, 2010. The second Red Button record, As Far As Yesterday Goes, was released in June, 2011. 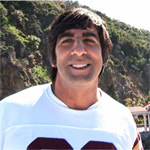 The Last Giant was Seth Swirsky’s first documentary release. It’s a 17 minute film of on-camera reminiscences of 1930s major league baseball All-Star Harry “The Horse” Danning. The film was a 2007 Finalist at both the Washington, D.C. International Film Festival and the National Baseball Hall of Fame and Museum’s 2nd Annual Film Festival. Seth lives in Los Angeles and has three children. I’ve been hearing good things about your movie from friends in Canada. As the lyricist for Newcastle Road and the songs on the CD Blue Suburban Skies (see Youtube reference), I’d be happy to send you a copy. Two tracks from the CD have been played on BBC Radio Merseyside. Your project sounds like it was a true labour of love. Hats off! Seth, I wish you could have interviewed me for you film. I would have told the story about how I tricked the hotel operator in Boston in 1965 (or 66) when I was 15, and got Paul and John on the phone. I spoke to John for 5 minutes. I also met George 2 times as an adult and got to hang out with him in a music store for an hour. Will your film be screened at the upcoming Beatles Week festival in Liverpool in August? I will be their discussing my research on The Beatles- BeatleMusings- an anthology of Beatle scholarship. If you send me a regular email address I can send you the first volume of essays in the project: A Chronicle of the Musical Legacy of The Beatles.